Scarface realises he must take action to avenge Vixen’s attack on Lady Blue, especially after she makes out it was unprovoked. He decides to arrange a full scale attack on Farthing land. Ranger is horrified and heads off to warn the Farthing animals. At first Friendly does not believe him, but still reports it to his father. Hare also overheard Scarface’s plans, and confirms that Ranger is telling the truth. Fox tells Owl, Kestrel and Hare to find all the animals and tell them to come to his earth. 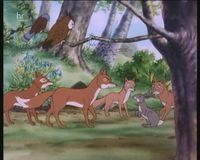 The Farthing animals gather at Fox’s earth, apart from the Rabbits, Weasel and Measly, who find their own hiding places. 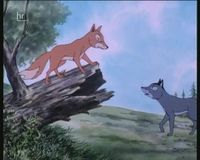 Fox promises the animals he will defend them to the last, and they all go deep into Fox’s earth, while Kestrel flies to keep an eye on Scarface’s progress. The blue foxes are frustrated not to find any of the Farthing animals, but Scarface soon guesses where they have all gone. Ranger tries to hide behind the rest of the tribe, but Scarface forces him to come to the front with him. Scarface and his tribe arrive at Fox’s earth, and Ranger offers to go inside to see if the animals are there. Ranger tells Fox he plans to tell Scarface the earth is empty, but then Scarface suddenly bursts in. Fox decides to challenge Scarface to single combat. After Fox goads Scarface, suggesting that Scarface has been afraid of him ever since he came to the park, the two foxes fight. The fight is long and bloody, but Fox eventually gets hold of Scarface’s throat in his mouth. Suddenly Kestrel spots the warden approaching. Fox has the oppertunity to kill Scarface, but instead lets go of his throat, and walks away. Why has he let him go? asks Friendly. He just hasn’t got the killer instinct replies Vixen. Scarface limps away, while Fox returns, victorious, to his earth. Owl, Kestrel, Whistler and Speedy find Weasel and Measly in their hiding place, and tell them the good news. 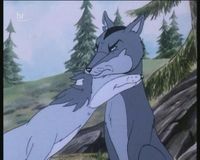 After Owl brings up the subject of Weasel giving Adder the wrong message, Weasel demands a retrial, with the White Stag. Although the White Stag realises Weasel’s extreme silliness resulted in her not giving the right message, he decides she did not do it on purpose. Weasel wants to throw the birds in the pond, as they did to her, but the White Stag decides an apology would suffice.